GUESS recently sent me this sweet pair of floral jeans from their 30th Anniversary Collection and I couldn't wait to style them! GUESS is such an iconic denim brand. I can remember wearing GUESS jeans as a child and feeling like the cool kid on the block because I had the jeans with the red/white triangle/question mark on the back pocket. Fast forward about 17 years and I still feel just as cool sportin' the brand. I decided to have some fun with these jeans by pairing them with a leopard sleeveless top. 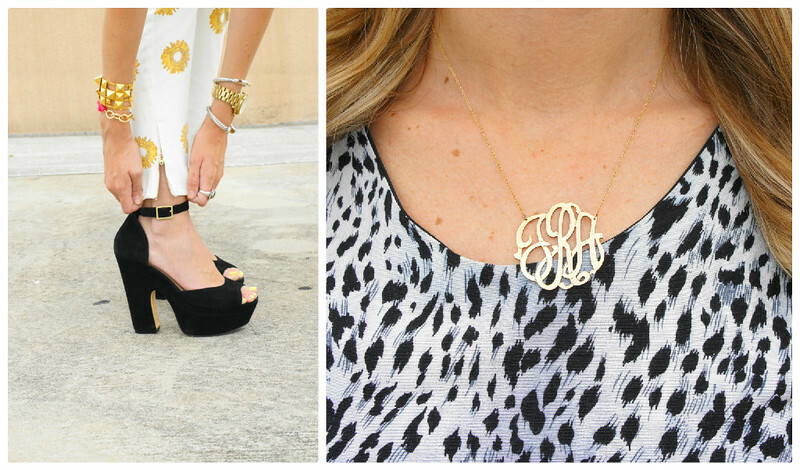 I just love it when two amazing prints come together in one great outfit, don't you? ;) Can't wait to pair these jeans with a comfy chambray top or a great vintage tee too! Hope ya'll are having a great week! I have been on travel for work and was just now able to get access to wifi. So glad I was able to post this week and not leave ya'll hangin'. Don't forget to enter to win the pink cross bracelet featured in this post HERE! Giveaway ends TOMORROW at 7 PM EST! Good luck! xo! Yay! The floral jeans from Saturday's instagram teaser :) I have been waiting to see how you styled them and more info on where to buy. They are absolutely gorgeous and I love how you mixed prints with the slightly cropped animal print top. You look stunning! Wow, I love, love, love this combo! You look sunny and gorg., as always. And I love seeing GUESS in a different color palette. Nicely done! Love your pants! And the shoes are gorgeous!!! You look wonderful!!! I could never pull off this kind of combination, but you look fantastic in it! Unexpected mixing, but somehow it works and looks fab on u! I am so in love with those jeans, and you did such a fun job of styling...looking absolutely beautiful! You look so beautiful!! Lovely pictures. I love those floral jeans! I was such a fan of Guess when I was younger! Love the fun and unique mix of prints! Really unique combination! It really works, great job. Oh lawd, do I love you for wearing this outfit! So. Stinking. Fierce. Also, your body is flawless, holy cow! So jealous. Those shoes, those pants. Good gosh, I could go on forever. You're great.